Microsoft is now displaying ads in the Windows 10 built-in Mail app. The ads are already in beta and could start to roll out to everyone. Microsoft could be bringing ads to its Mail app in Windows 10. The Windows Mail app is the default email app in Windows 10 and, while not great, has improved quite a bit over the years. At the time of this writing, the ads are only displaying for a select set of users without an Office 365 subscription. And they not coming to everyone – yet. Ads in Windows 10 Mail App? Today the ads were reported by the Windows news site Aggiornamenti Lumia. And in another report today from The Verge, some users have been seeing ads in the Mail app since this past summer. The ads may appear if you are not an Office 365 subscriber and running version 11605.11029.20059.0 of the Mail and Calendar app. The banner ads will show up when Focused Inbox is enabled in the “Other” section. The ads are equal service offenders. It doesn’t matter if you’re using a Microsoft email account or not. The only way to get rid of the ads is to become an O365 subscriber which is explained in a large pop-up screen within the app. This isn’t the first time the company has been annoying with its advertising strategy in Windows 10. 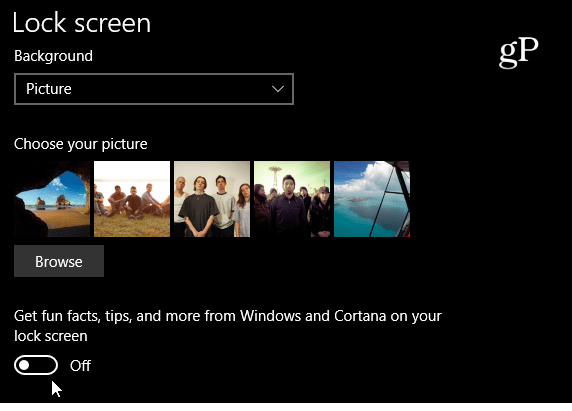 Since Windows 10 was initially released, the company has been introducing ads on the Lock Screen, in its News app, the Start Menu, and even in File Explorer. The ads are typically for Microsoft products, but it’s irksome behavior nonetheless. The good news is you can disable a lot of the advertising throughout Windows 10. For example, to turn off ads on the Lock Screen, head to Settings > Personalization > Lock screen and switch them off. Arguably the most offensive ads started to appear in File Explorer. But you can turn them off by going to Folder Options and disabling the “Show sync provider notifications” option. For full details, read our article on how to disable ads in Windows 10 File Explorer. The good news is these Mail app ads are currently in a beta pilot program; they may not be coming to everyone at all. According to a Microsoft FAQ, the pilot program is testing in Brazil, Canada, Australia, and India. If you are seeing them, make sure to express your displeasure in the Feedback Hub to let the developers know nobody wants more ads in Windows 10. Also, Microsoft’s head of communications, Frank Shaw tweeted that they were an experiment and is being turned off. Still, Microsoft has implemented ads as a way to help monetize Windows 10 in the past, and we can expect more tests like these in the future. What do you think about Microsoft putting ads into Windows 10 and its apps? I think that people have already paid for Windows 10 itself and there are enough annoying ads on the Internet. Is there no end to the greed? Microsoft’s head of communications, Frank Shaw tweeted that they were an experiment and is being turned off.I guess it will turned off. I am a subscriber but I use Firefox which has an ad blocker free of charge unlike Microsoft Edge.